April offered some unique challenges for my running that made it difficult for me to meet my mileage goals for the month. I was unable to run during our days at Williamsburg (no one to watch the boys), and then the rest of the month involved a throat infection and a strained back which took me off my runs a bit. I did my best to run when I could, and overall didn't have a bad month. I ran two 5Ks this past month. The first was the Roanoke River 5K on April 7th. It was nice weather and a flat course. I did have problems with my lungs burning the last mile (and then for about 10 minutes afterwards). It was strange. I ran alright though with a time of 23:26 and a medal for placing first in my age group. The second 5K was this past weekend - the Vinton Dogwood Festival. I actually ran this race when I was 4 months pregnant with Pierce, and I had memories of huffing and puffing up this HUGE hill during the race. A friend running beside me at the time was so concerned he asked if I needed to stop, but I am stubborn, if nothing else. Thankfully, the hill shrunk significantly since I was pregnant (ha ha). It was still a somewhat hilly course - enough to slow me down a bit - but not too bad. I ran 24:06 and other racers claim the course is just a tiny bit long. I was fortunate enough to place 3rd female overall and won a trophy. 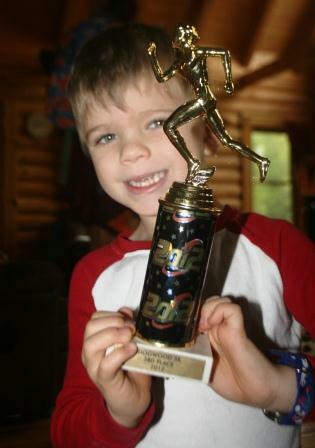 Pierce was very impressed with the trophy and put it on display in his room. Total running mileage: 100 miles, just by the hair of my chinny chin chin. Next month I won't be able to run the 10K I was targeting because Paul will be out of town, and I don't have anyone to watch the boys. So I'll probably just do a 5K in May and hope to hang on to some of the speed I built this past winter. My glute is still quite bothersome, but hopefully it won't become a bigger issue. Any goals for you in May, readers? Congratulations on your well deserved runs! Wish I were closer...I'd watch the boys for you. It looks like the boys will have a lot of medals and trophies to display. Congrats on an excellent racing month and on making that 100 miles. That was a squeaker! You did awesome! I love that he put up the trophy in his room! He should be proud of his mama! Looks like you still had a great fitness month, despite minor health issues and temporary solo parenting. Looks like Pierce is very proud of that trophy! Awesome month despite your owies! I think you deserve a standing ovation for your accomplishments Lisa. I have put running on the back-burner since all the kids want my time here. I now count exercise as tag, kickball, and backyard football. I am still able to work with free weights three times per week and mix in an occasional bicycle ride, but nothing worthy of goals. That's amazing since you've been sick and that had to slow you down! YOU are a Speedster! Way to crank out those amazing 5k times! Wow!! very nice month foryou.I am training track stars for special olympics right now. I have heard that you should continue to exercise when pregnant...but run a 10K. That is dedication! You are amazing! How you ran a race while pregnant, I'll never know. I hate doing anything and everything when I was pregnant, lol. You amaze, humble and inspire me. The end. Since your glute is still bothersome, maybe it's a good thing that you can't run that race while hubs is out of town? Any goals I would have look like peanuts compared to yours!! My goal is just to walk without falling and not pull or tear any more muscles! You are amazing to do a marathon pregnant! You sure do go through a lot of pain to run. I don't think I could do it. Kudos to you! Congrats, Lisa. I am so proud of you for keeping up your running. It's hard once one is married with children--but you manage to keep doing it... That is AWESOME. Our exercise at this age of our lives is WALKING... BUT--we do a pretty good job with that!!!! Your fitness accomplishments really inspire me, Lisa. As busy as you are, you make time for exercise. That is so healthy! You are amazing. You mentioned your back was hurting-- is that a glut? I'd watch them for sure if I lived close enough. I know something about that yearning to get out there. I can't wait to start running! I've been having foot troubles. I have arch supports coming my way that are made just for me. They will balance out my left foot that keeps turning in! Wonderful, my wife also loves running. I would say you had a good month :O), though I understand about setting goals. Your doing super!